Physkos in early March. The sky is blue, sea turquoise, and the forests erupting with a carpet of wild flowers. Twelve adventurous guests are about to get off the beaten path onto a road considerably less travelled. 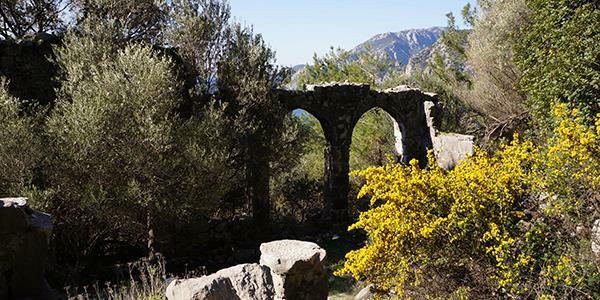 The Carian Way (Karia Yolu) runs for 800kms from Içmeler in the south, hugging the Anatolian coastline to Bodrum in the west. This area was known as Caria in ancient times. In Homer’s Iliad the Carian are people “of incomprehensible speech” (they didn’t speak Greek), who sided with the Trojans in the Trojan Wars. Herodotus describes them as sea-faring people and great traders. Bodrum, the ancient Carian capital of Halikarnassus, the villages and hilltop settlements date back over three millennia to the Bronze Age. The long-distance trail rediscovering many of the old shepherds’ paths and forest trails was established in 2013. It passes through Turunç, so it was only natural to use Physkos as a base from which to explore the section along the Bozburun Peninsula. The walk kicked off under perfect conditions: clear blue skies, occasional wisps of puffy white clouds, a light breeze and pleasant temperatures. To break the group in gently the first walking day was short, the route rising up behind the neighbouring resort of Içmeler – a half-hour drive along the switchback access road to Turunç, but for us a tortuous three-hour walk along rocky paths, through scented pine woods carpeted with wild thyme, marjoram, rosemary, sage and lavender (the garrigue flora), cyclamen, cistus shrubs and strawberry trees on the verge of exploding into flower. The sunnier clearings were already sprouting purple orchids, yellow fritillaries and tassel hyacinth, and several sluggish tortoises stirring from their hibernation; even an eagle circling overhead. 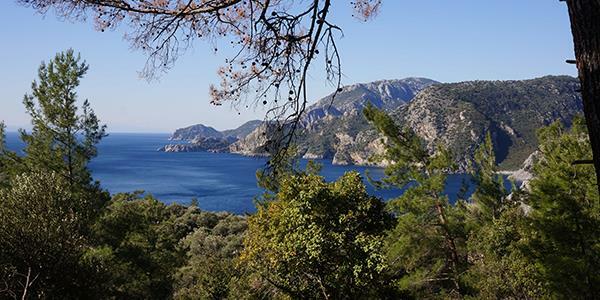 Distant views over the sea towards Marmaris, the occasional sailing boat well below, and the faint strains of a call to prayer were the only hints that these long-neglected paths are on the doorstep of one of the Mediterranean’s premier holiday spots. While clearly not in regular use, and requiring the occasional short scramble, the paths are way-marked, and in places used for access by villagers collecting wild herbs and firewood. 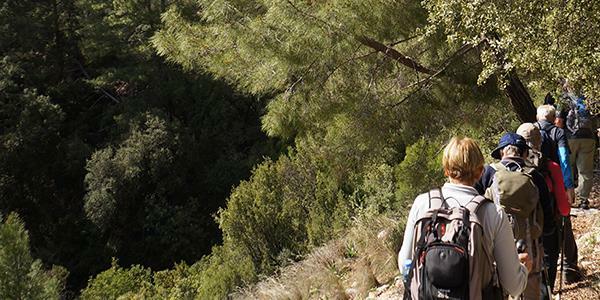 On this first walking day the trail followed an undulating route, at times steep, occasionally overgrown, climbing relentlessly to the Içmeler Gap at 380m elevation. A well-earned lunch stop followed, with fabulous views over the Bay of Marmaris. The afternoon’s gentler slopes were easier, with more attractive open vistas along the coast, culminating with our arrival at the Turunç road and return to Physkos. The next day broke to clear blue skies, the initial chill soon giving way to the warmth of dappled sunlight, delightfully punctuated by fresh breezes bringing relief to the day’s climbs. 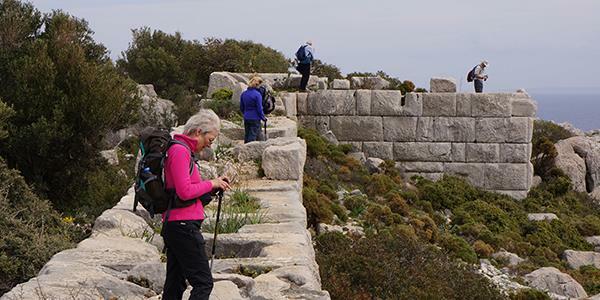 Bypassing the short walk from Turunç to the Hellenistic citadel on the promontory at Amos, a relatively easy one-hour walk from Physkos, our group (thinned now by some taking a rest day) had a short minibus ride to Kumlubük Bay to start out along an easy forest track. This soon gave way to steep rocky limestone sections alternating with open forest carpeted in pine needles, clumps of the garrigue flora and occasionally the maquis of fragrant bay trees, carob, turpentine and prickly holm oak, with bushes of broom and myrtle. And emerging from the forest floor, or amidst the fractured rocks: flowering iris, anemone and euphorbia. Our first destination was Ilimar, crossing ancient overgrown terraces to this former Carian settlement, with its later ruined Byzantine church. Situated above a sheltered bay and by one of the few flowing streams on the peninsula, it offered impressive views across to Rhodes. The day’s ultimate destination required a tough ascent over the peninsula and then descent to the village of Bayir, famous for the reputedly 1,800-year-old chinar tree, and a very welcome tea stop after 15kms and five hours walking. But first, the passage through forest, where wild boar had been rooting through the carpet of pine needles, by way of an impressive rocky belvedere above Çiftlik Bay. Then through cultivation terraces dotted with ancient olive trees and almond groves, with only the occasional goatherd or sheep for company. Finally the descent beneath impressive limestone escarpments along ancient walled pathways into the village. All in, a delightfully varied day’s walking: not for the faint-hearted, but bestowing a sense of achievement, and with the added benefit of an opportunity to purchase local honey, herbal essences and almonds in Bayir. A hazy and cooler start for our third walking day. The full group mustered to take the minibus back to Bayir to begin the morning’s walk. 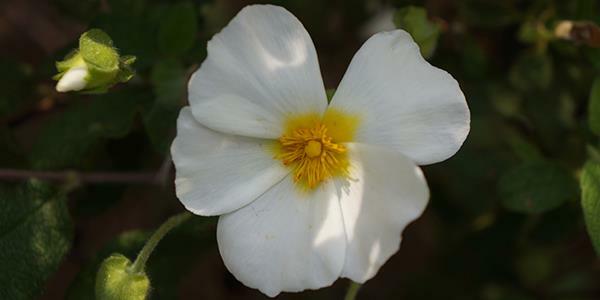 A short climb was followed by a stroll along ancient pathways bordered by dry stone walls, crossing cultivation terraces strewn with an oriental carpet of wild flowers: anemones amongst oxeye daisies, marigolds, mallow and turban buttercups, occasional mandrake, and the ubiquitous sea squill. 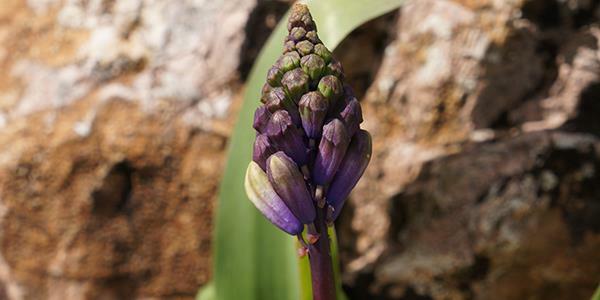 With extensive meadows of asphodel we could have been in the company of Odysseus at Homer’s gateway to the underworld! Altogether a different, gentler landscape, reminiscent of green lanes through the Yorkshire Dales, but with added olive trees and fragrant herbs, making for an enjoyable walk. We met the road at lunchtime, allowing those of us who wished to retire for the day to board the minibus back to Physkos, satisfied with having spent a delightful morning. Following a short road walk the rest of the party started the toughest trail section of the week: the col over “Mount Stephen”. 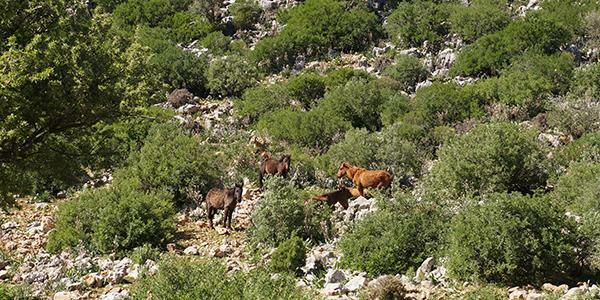 Ascending by narrow mountain tracks through dense maquis vegetation, negotiating some steep rocky sections, the trail emerged on a shrub-covered plateau at 450m elevation, with only a few mountain cows (how did they get there?) for company. 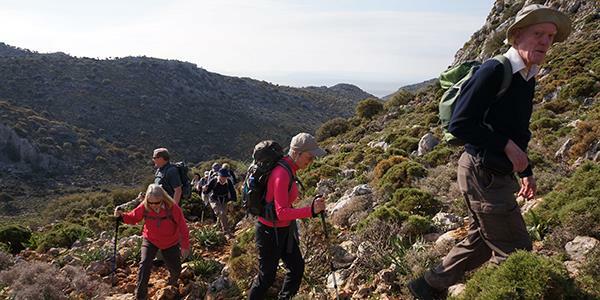 Next, the long rough descent, high above the spectacular Mediterranean coastline with distant views of Rhodes: a challenging walk along fractured limestone karst and rough scree, eventually meeting the farmer’s track through almond groves to finish in the village of Sögüt. A strenuous day, leaving all of us looking forward to the following day’s rest. After a day off (lazing by the pool; the walk to Amos; water taxi or dolumus to Marmaris; spa treatment on site; or a real Turkish barber in Turunç perhaps?) walking resumed, with the minibus journey back to Sögüt. Crystal-clear blue skies and a chill wind greeted us, as the trail led up a well-made path out of the valley. 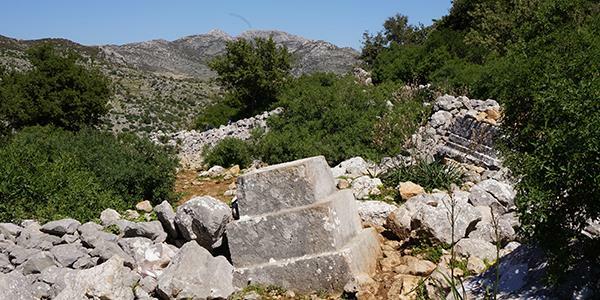 This emerged onto rough mountain paths below Kale castle, a substantial Carian lookout tower providing spectacular views, from the snow-covered Taurus Mountains in the east to Rhodes in the west. A gradual descent followed, through a more managed landscape, towards the village of Taslica. Crossing ancient terraces before following green lanes through well tended fields of wheat, the faint strains of wedding music drifting from afar. On arrival in the village our group was pressed into joining the bride’s wedding feast! Eager hands cleared tables and chairs, and a tasty spread of casseroles, pickles, rice, vegetable dishes and desserts was placed in front of us, with curious onlookers eager to engage in conversation. Such tremendous hospitality in a remote rural village, which clearly rarely sees any tourists. After our delicious and unexpected lunch, onward: a short road stretch to rejoin the trail as it ascended through substantial tumbled blocks of carved masonry, the ruins of the ancient Carian city of Phoenix littered across the area, towered over by the more recent fortified Byzantine citadel. The trail continued across these extensive and unexplored remains, the ground strewn with pottery sherds, through the Greek settlement abandoned in the forced population exchange that followed the Turkish War of Independence in the 1920s, and across the old ridge and furrow field systems of a fertile valley. Finely worked Carian masonry lined the track, perhaps the remains of the ‘agora’ or meeting place, as we came upon wild horses which roam these distant reaches of the peninsula. At last we descended on a stone-laid path, polished smooth through centuries of use, emerging onto the road by Serçe Limani bay. Another fine and varied day, through a more cultivated landscape. Our last day was decidedly warmer and a little humid. The minibus drove us back to the previous day’s finish point and we began the gentle but rocky climb through the natural open limestone rockery. Pink and white cyclamen were in flower everywhere, with anemones, star of Bethlehem, iris, Barbary nut and the occasional arum lily also in bloom. 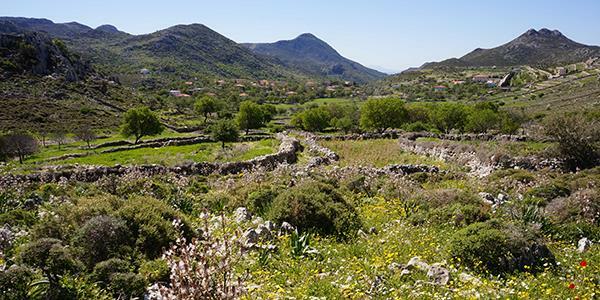 We emerged onto a plateau surrounded by the remnants of another abandoned Greek settlement, and then up to the col, giving us the first views towards the trail’s end. Descent involved the traverse of rough scree and garrigue vegetation: steep, with slow progress, down into the valley. We walked again through fields of asphodel, to the pebbly shoreline where wary donkeys kept their distance. Some of us dared to remove boots for a refreshing paddle. Then round the bay to climb the massive three-metre-thick walls of Loryma Castle, guarding the entrance to the bay and overlooking the straits to Rhodes. This was an important military port for Athenians during the Peloponnesian War in the fifth century BC and a Rhodian stronghold until incorporated into the Roman Empire. A fitting place to end our walk along the trail, but not quite our journey. There is no road access to Loryma, but waiting by the jetty was Fistik, the restored classical lifeboat from Dionysos, ready to take us back along the length of the peninsula. On board we had celebratory drinks and a relaxing three-hour sail back to Turunç; time to reflect on the five days it had taken us to walk this same route. Excitement was provided by the accompanying dolphins breaking the waves beneath our bows. The total distance walked on the trail was about 60kms, over five walking days and about 30 hours. Not long distances, though terrain at times was steep; the rocky conditions justifying the grading as moderate to hard walking. 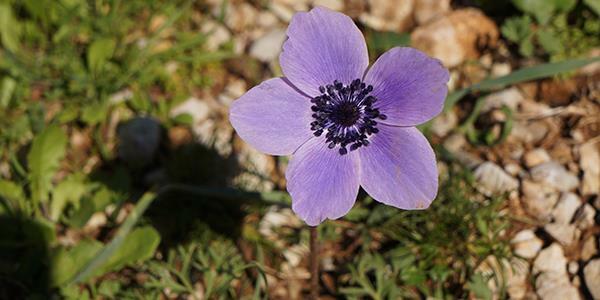 Mention should also be made of our excellent guide, Gokhan; the convivial company of our group; that with the exception of a few animal herders and bee keepers we saw no other people on the trail; and of the superb dinners cooked at Physkos. 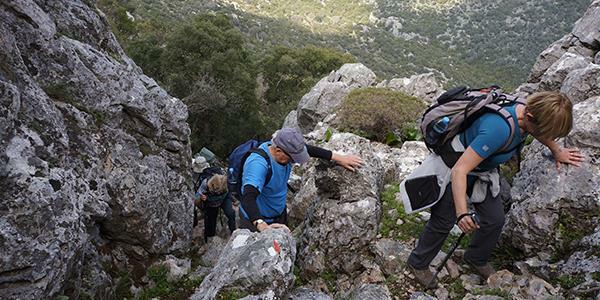 If you are reasonably fit, enjoy walking, have an interest in ancient history, or just a sense of adventure, then the Carian Trail is certainly for you. You'll return home with some incredible memories and serious bragging rights.